Heal Stress with a Fish Aquarium! Stress is a killer and also related to the two most common mental conditions facing modern men and women: anxiety and depression. The source of these illnesses are impossible to ascertain - research suggests that there certainly can be genetic links to mental illness, yet without a doubt, the fast pace of daily life and our alienation from the natural environment, has plenty to do with it. The fact is that Nature is the world's most efficient, cost-free de-stressor. Various large-scale studies have shown that time spent in nature keeps anxiety and other stress-related conditions at bay by lowering our heart rate and blood pressure, and reducing levels of stress hormones in our body. Nature has been found to soothe pain and have a restorative effect on our mood. When we speak of nature, we don't mean simply enjoying time in green spaces - we also mean contemplating the relaxing, soothing, colourful site of fish, swimming in a beautifully designed aquarium. Those who have an aquarium will tell you that at the end of a long day at work, few things quite soothe the mind and calm the spirit, like contemplating the movement of fish - a process that can last for several minutes, sometimes over an hour! The human relationship with and need for water is instinctive. In the same way that many of us head for the beach to listen to the waves crash onto the shore or view the water shimmering, so, too, the site of the life and colour in water as provided by an aquarium, can be immensely satisfying and can fulfill our need to contemplate the beauty of nature, in our own bespoke marine setting. Lowering stress hormone levels: Stress hormones such as cortisol play an important role in protecting us against danger, when our "fight or flight" response is invoked. However, when we suffer from chronic stress or anxiety, and our bodies are subjected to chronically high levels of cortisol, both mental and physical illness can ensue. Having pets helps us lower cortisol levels and enjoy a greater sense of wellbeing. Reducing our heart rate, breathing rate and blood pressure: Simply being near our fish calms the body by restoring our functions to a calm state, without any effort at all on our part. Good vibes: Interacting with our pets (this can include anything from feeding our fish or watching them play or swim through toys and structures in our aquarium) releases endorphins into our system. The latter are known as "feel good" hormones because they lift our mood, enhance our imagination and even promote better brain function! Promoting mindfulness: Anyone who is into the subject of health will know that the buzzword in the media these days, is mindfulness. To put it simply, mindfulness involves being "in the here and now". There are many ways modern men and women aim to achieve mindfulness. One is through mindfulness meditation; another is through yoga, which usually includes breathing and mindfulness components . However, mindfulness can simply involve making an effort to enjoy the present moment - to get lost, as it were, in the beauty of a natural setting, enjoying a moment with one's pets (playing with a dog or going for a walk with one's pets, for instance). When it comes to fish, nothing quite calms the spirit like watching our fish swim around, interact, feed, carry out their mysterious routines, etc. Even caring for our fish - cleaning our aquarium, adding features, etc. are inherently mindful activities, since they call upon us to exercise our full concentration and make it very easy to forget about our problems, to stop us worrying about the future, and to escape from destructive, negative thinking patterns. 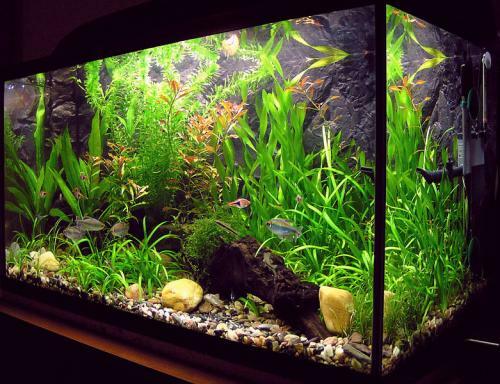 People bring aquariums into their homes for many reasons: some to enhance the beauty of their home, others to enjoy the beauty of exotic or familiar fish on a daily basis; still others to experience the benefits of having a pet without having to dedicate too much time to them. Whatever your reason is, rest assured, by owning your own aquarium, you will be reaping many more benefits than you ever imagined. Aquarium photo by Ales Tosovský (Own work) [Public domain], via Wikimedia Commons Copyright © 2008-2019 AboutFishOnline.com. All rights reserved.